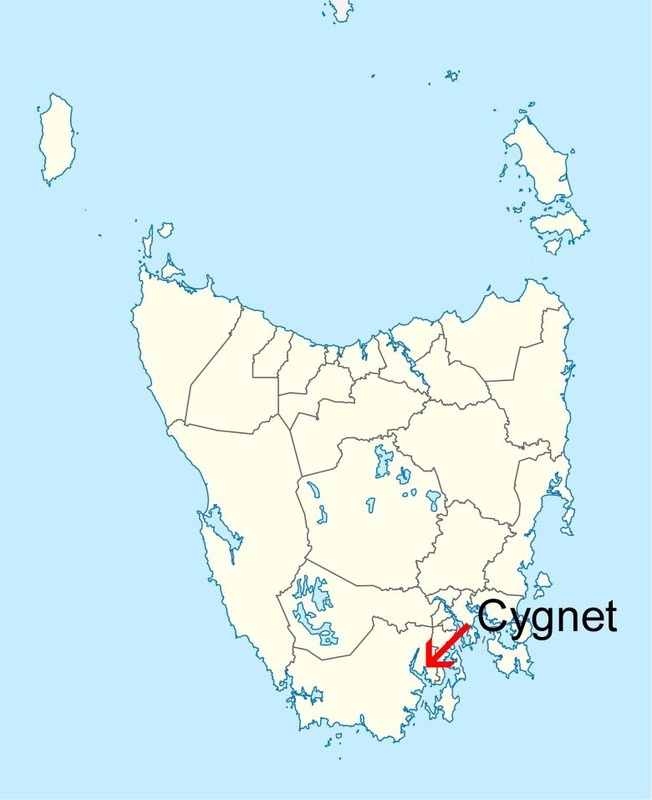 Port Cygnet was first named Port des Cygnes (Port of Swans) by French navigator Bruni D’Entrecasteaux in 1793 because he observed a large number of swans in the area. 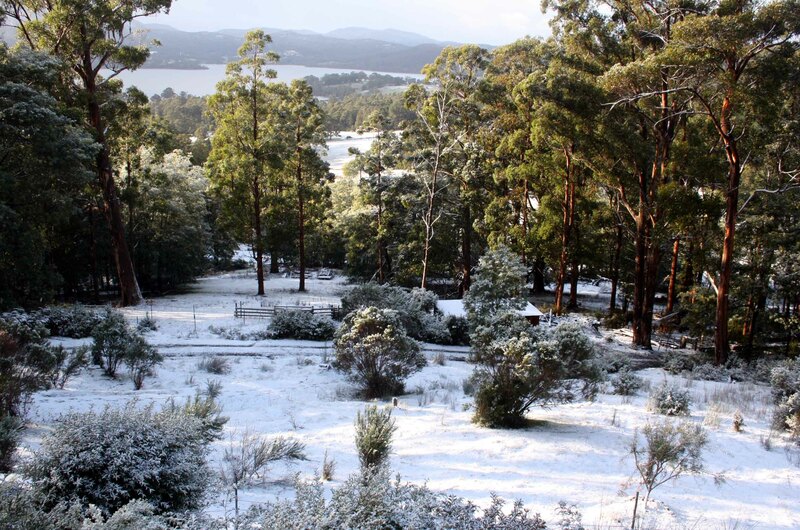 The township is located at the head of an inlet off the Huon River estuary about 55km SW of Hobart and is surrounded by wooded farmland and the water. It’s something of a mecca for artists, musicians, craftspeople and other creatives and is the home of the ever more popular annual Cygnet Folk Festival which takes place in January. Musicians and music lovers from mainland Australia and around the world have been enjoying it for over 30 years now and many new residents came for the festival and enjoyed themselves so much that they never left! Good food and drink is also enjoyed with fresh local produce a feature on the menu of many of the food outlets in town. There are several arts groups and studios, print workshops, galleries and craft shops. 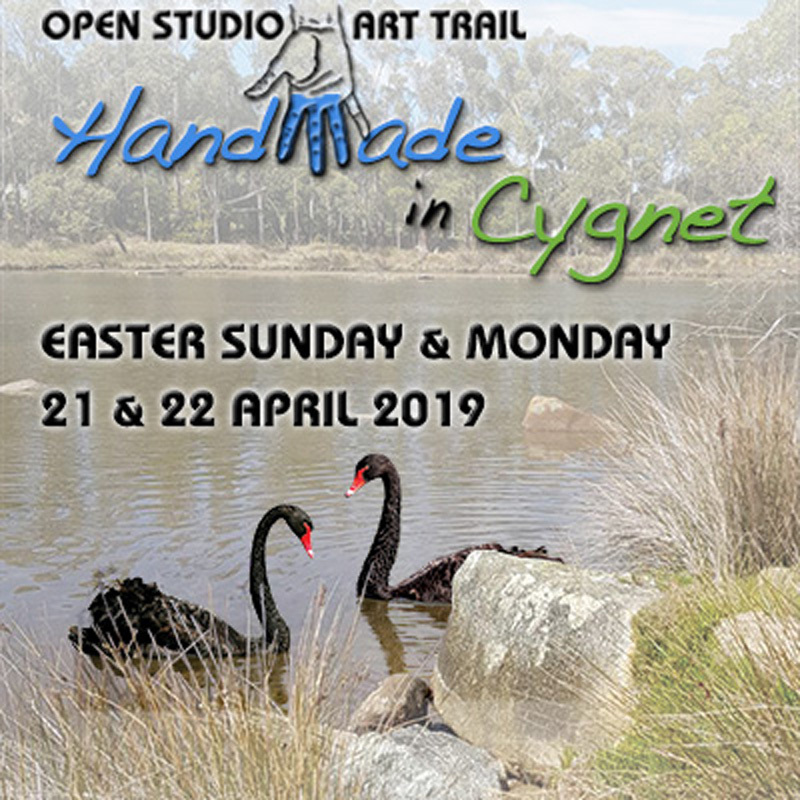 Each year there is an exhibition of local artists’ work in the Town Hall ( HAEG ) and at Easter there is an open studio art trail “Handmade in Cygnet” . Local artists and makers open the doors of their studios and workshops and invite visitors to view their work. Many will have work for sale and/or take commissions and although there is absolutely no obligation to buy it might be hard to resist some of the treasures discovered on the trail. There is also the public library, a children’s toy library, the local history museum and the sports clubs: football, tennis, golf, sailing, riding, bowls. An indoor Sports Centre and a wide range of other organised (and semi-organised!) activities such as table tennis, tai chi, rowing, cycling, yoga, U3A , Community Garden, Men’s Shed and more. Something for everyone. There is a catholic school (St James) that caters for primary to year 10, a state primary school (Cygnet Primary) and a private primary school nearby (Peregrine). 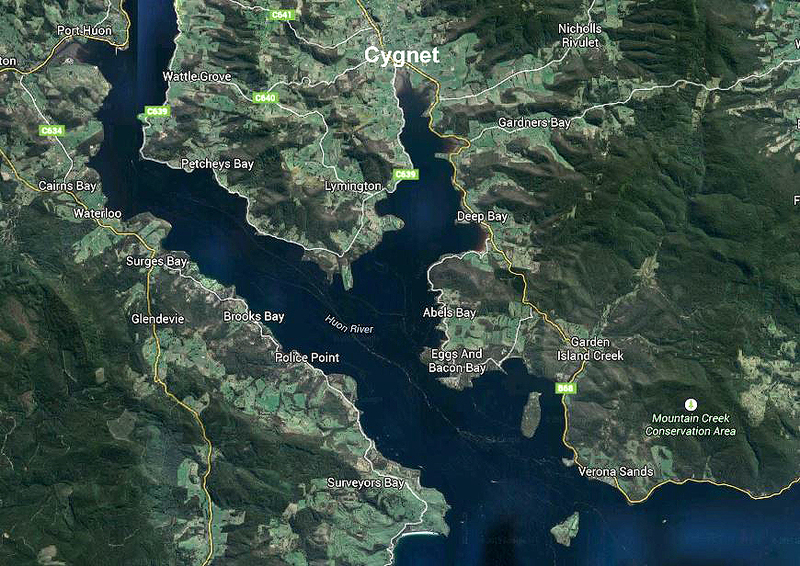 Just south of the township is the inlet of Port Cygnet with its many bays and beaches. It opens into the Huon Estuary and offers safe mooring for many local and visiting craft with excellent all weather, calm water, sailing. Historically a boat building centre it’s the home of the Port Cygnet Sailing Club which is very active with racing, cruising and social activities and has two good slipways. 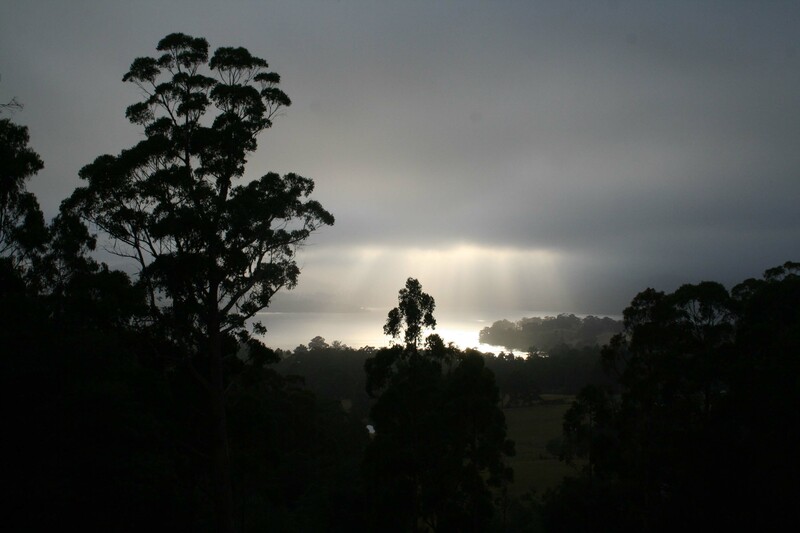 Port Cygnet opens to the beautiful D’Entrecasteaux Channel to the south-east and the Huon River to the north-west. Despite being on the same latitude as Marseille in the far south of France we do not have the same climate. Rainfall averages about 850mm pa and is fairly evenly spread over the year with the wettest months being in winter and, surprise, the driest in summer. That’s about 75% of Sydney’s rain and a little more than Melbourne. Yes, it does rain more in Sydney than in Melbourne. Being surrounded by the relatively cool Southern Ocean the temperature is only rarely extreme. The mean maxima in summer are around 20º C and about 14º C in winter while the mean minima are about 10º and 4º respectively. Don’t be fooled: the temperatures may not be high but the sun is still strong. Just like in Marseille. It can be windy. Very windy. The weather is very changeable with fronts sweeping in off the ocean from the west. It’s always a good idea to have some spare clothing with you. You may not need it but when you do, you do: especially if you go hiking in the highlands or out on the water. The weather forecasts are getting better (and more accessible) all the time so take advantage of them.